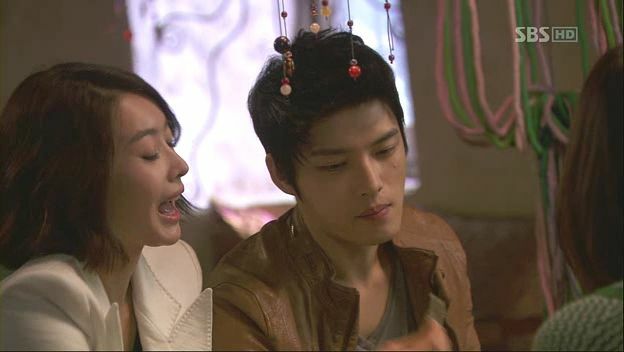 What can I say about the final episode of Protect the Boss? Better late than never? Why did it take you so long? How about just a “thank you for somewhat returning to form and going out with a fist pump and a farewell bow.” Even with no expectations beyond simply wanting this story to end so I can finish this recapping project, episode 18 of PTB did try to return to what I so loved about it. For that I am truly grateful. While the story always felt like an exaggerated version of a slice-of-life drama, it was quirky and different enough with a downright kind heart that watching it just made me happy. I’m thrilled it chose to end the same way it arrived, even if plotwise it remained quite a stretch to get there. I’ll let the less-than-steller middle episodes slide and always remember it for its attempt to think outside the K-drama box. Ji Heon announces to the gathered media that he fell for Eun Seol at first sight because she is a whistleblower who tells the truth about wrongdoing. Everyone reads online this explosive declaration from Ji Heon. Eun Seol and Ji Heon run off to the park. She asks him what he thinks he’s doing? He asks whether she’s ready to enter the eye of the storm? She yells at him for turning innocent her into the whistleblower, and for confirming they are dating when even that is not true. Ji Heon asks Eun Seol if she knows who the real whistleblower is? And does it matter if she tries to explain? No one will believe her anyways, plus reporting wrongdoing is not a bad thing. As for the dating, Ji Heon says he’s never stopped dating and being in love with Eun Seol. She asks how he can recover their lost 4 months and 2 days? Eun Seol wonders how Ji Heon is going to get out of this mess? He doesn’t think there is a mess by telling the truth, and he can’t stop people from making a big deal out of it. What if he gets tossed out of the company, Eun Seol worries? Ji Heon says not to worry, someone will help him take care of the mess. Which is when Moo Won calls, and Ji Heon asks him to take care of everything from here on. The Chairman is out doing community service sweeping the streets. He sees some delinquent school girls and thinks back to Eun Seol and smiles. The Chairman tells the two girls they will look back on this period in their lives as a dark period and regret it. The two girls call him a pervert and leaves. The Chairman reminds himself that Eun Seol won’t do and he can’t relent. Moo Won gets a report from his secretary that the media is unhappy with the company response. Moo Won complains that Ji Heon gets to do the cool things and leaves the rest up to him to clean up. Moo Won runs into his mom and asks if she leaked the scandal, to which she denies it. Moo Won tells her she can deny it all she wants, but no one will believe her. 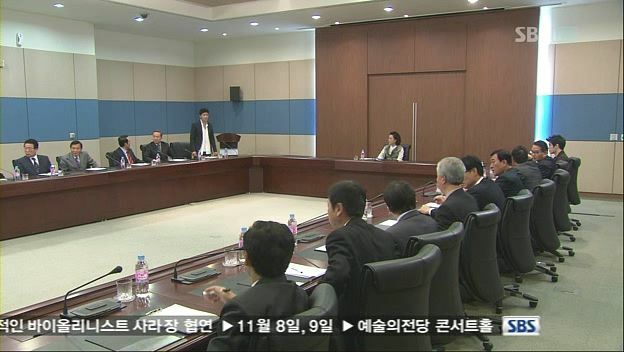 At the board meeting, the directors are unhappy with Ji Heon. Moo Won suggests everyone hear Ji Heon out first. The Chairman walks in demanding to know what’s happening. He goes back to Moo Won’s mom’s office and accuses her of creating this scandal. She gets a call from Grandma who thinks she did it, and wants her to resign her temporary Chairman position now. Moo Won’s mom keeps trying to explain that she didn’t do it. Eun Seol snarfs down a pastry in the park while Ji Heon wonders how she can eat at a time like this. She says she needs to feed herself to have the energy to face life. Ji Heon says he wants to create a middle world where he and Eun Seol can live, since either of their worlds are too far apart. He wipes the cream off her face. He takes out his phone and shows Eun Seol that they’ve made the news already. Ji Heon and Eun Seol get called home by the Chairman. Moo Won’s mom confronts Na Yoon’s mom about revealing the scandal to the media to make Moo Won’s mom unable to face her mother-in-law. Moo Won’s mom says there is no proof she did it, plus anything bad for Ji Heon is good for Moo Won. 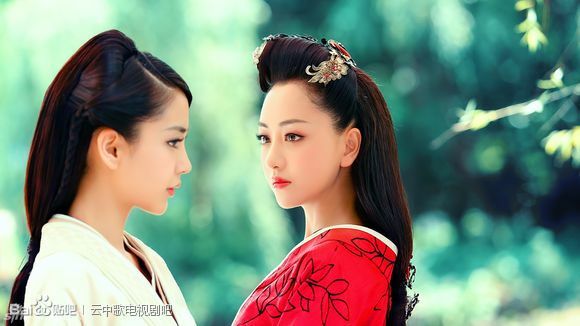 They two ladies start to pull each other’s hair and fight, which is when Na Yoon arrives. Na Yoon tries to stop the moms from fighting but neither mom will let go of each other’s hair. Na Yoon calls Moo Won and asks him to come and help stop the fight. Moo Won drives his mom home as his mom complains that she can never forgive Na Yoon’s mom and can’t ever become in-laws with her one day. Moo Won says his mom’s hair looks fine, telling her to go home and cry it out. He needs to go comfort another woman first. Moo Won sits next to Na Yoon and tells her everything will be fine. They just keep doing their own thing to the best of their ability. Na Yoon puts her head on Moo Won’s shoulder. He complains it’s heavy, but then smiles and puts his arm around Na Yoon’s shoulder. Ji Heon sits next to Eun Seol and faces the elders. 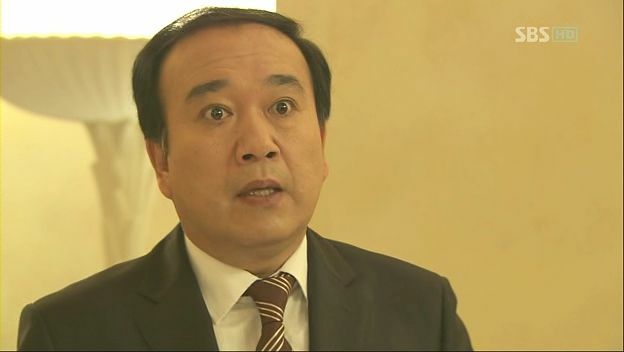 Ji Heon says he’s not cut out to be Chairman. 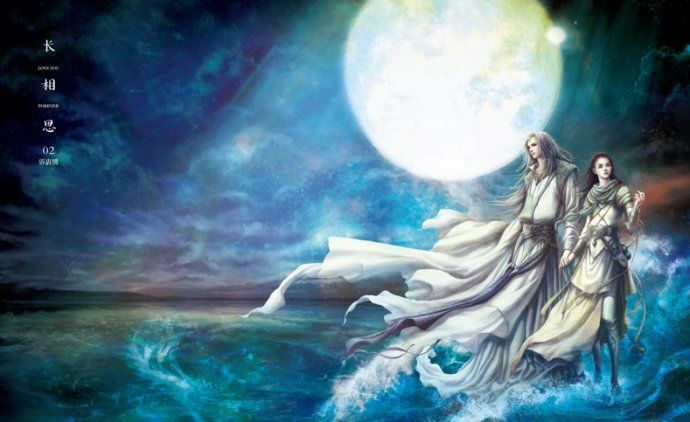 He’s fulfilled his agreement to return to the company, and he wants to do his job well and still find a measure of happiness. 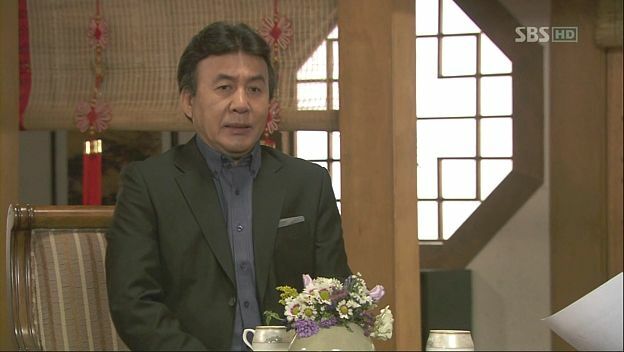 The Chairman asks if Ji Heon is doing all this because of Eun Seol? Ji Heon says Eun Seol is still mad at him, so right now it’s just one-sided that he wants to be with her. Eun Seol pipes up and says she likes Ji Heon, too. Ji Heon turns to look at her in shock. She apologizes to the Chairman, asking him not to be angry. She will try her best, as long as she can be with Ji Heon. 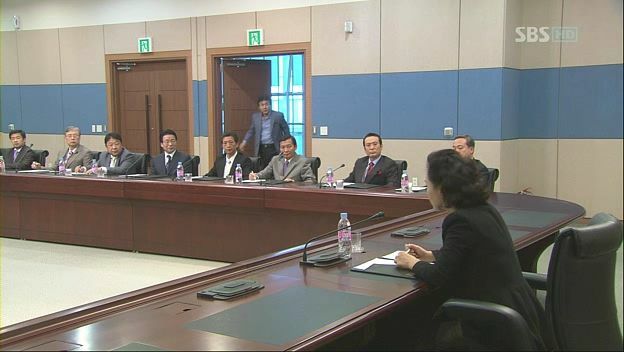 The Chairman asks if Eun Seol demanded Ji Heon give up the pursuit of the Chairmanship. The Chairman says he’s a cancer survivor and doesn’t know how much longer he has in this world, how can Ji Heon so disappoint him. Ji Heon yells at him for pulling the sick card when he’s clearly all well. 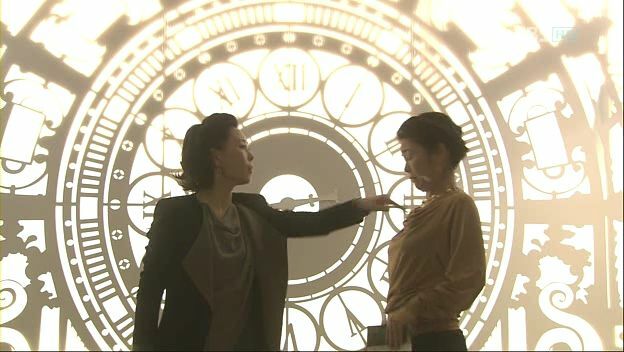 The Chairman gets up to hit Ji Heon and Eun Seol inserts herself in the middle, pleading with him to stop. He tells her to move it or else she’ll get hit like last time. Grandma tells him to sit down. 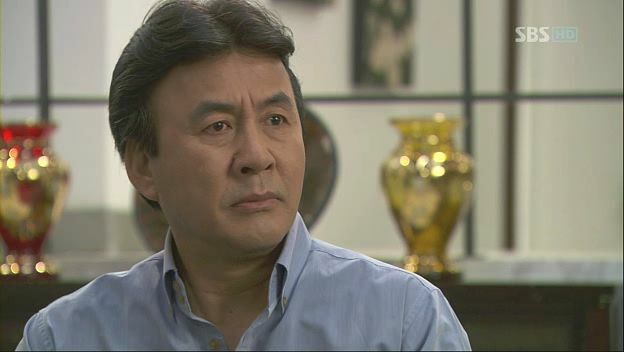 The Chairman says if Ji Heon won’t obey him, then he wants the both of them to leave now and never come back. Grandma says she’s neutral in this. Eun Seol tries to beg the Chairman to please accept her, but Ji Heon drags her out. Eun Seol worries that the Chairman may get sick again. Ji Heon says the cancer was detected early and he’s all fine now, look at how loud he was bellowing back there. Ji Heon says they can date in public now that everything is out in the open. Grandma tells the Chairman to stop pouting. He’s actually the one to make Ji Heon and Eun Seol closer by kicking them out of the house together. She tells her son to give up and concede he’s lost. Eun Seol and Ji Heon arrive at Myung Ran’s looking for a place to crash. Myung Ran says he can stay, but she won’t be there since she promised ice-cream to sleep over at her place tonight. Ji Heon laughs at how awesome Myung Ran is. Myung Ran is watching a wrestling program while Na Yoon talks on the phone with her Moo Won. 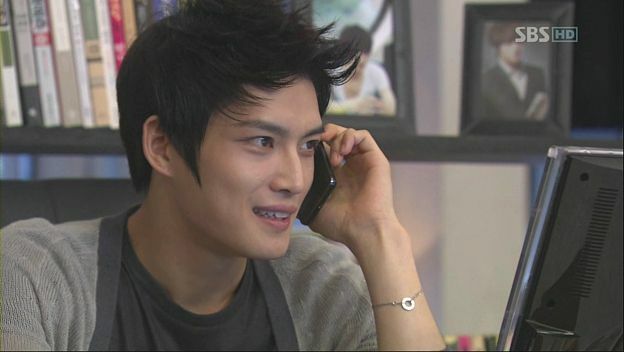 Myung Ran calls Secretary Kim. Na Yoon pouts when Moo Won wants to end the call, so Moo Won sings her a lullaby. Oh my squeee. Suddenly he stops singing when he sees another article refresh on his computer, which reveals Eun Seol’s delinquent background, complete with pictures of Myung Ran. Ji Heon and Eun Seol are reading the same article as well, which even goes so far as to say Eun Seol beat up her co-workers at DN Group. The media is calling Eun Seol the National Roundkick Girl. Ji Heon looks at the picture of teenage delinquent Eun Seol, marveling at this side of her he’s never seen. She gets upset and goes inside. He follows her and they start calling each other names teasingly. When Ji Heon complains that he can’t sleep, Eun Seol brings him a glass of milk. He says he’s not a kid and doesn’t want to drink it, but she insists. He drinks the milk and then kisses her a few times on the lips, before pushing her down on the bed, saying that he’s going to sleep now. The next morning, Eun Seol and Ji Heon sneak into the office. In the secretary’s office, Eun Seol is dodging the looks the other secretaries are shooting at her. They snerk that she’s gotten so famous. Eun Soel complains that they leaked the story about her beating them up, but they say they didn’t write it. Eun Seol runs off to a class because she can’t stand being the center of attention sitting there. Ji Heon stands up during a board meeting and announces that even if Eun Seol is the bad seed as the whistleblower, but if she’s part of the bad organization, then everyone must take responsibility for any fallout. He’s decided to quit, but reminds everyone that he’s still a big shareholder at DN Group. The meeting concludes and everyone files out. Eun Seol waits outside for Ji Heon, who happily joins her. Moo Won pulls Ji Heon aside and asks if Ji Heon planned it all. Ji Heon says he didn’t, but when the scandal erupted Ji Heon decided to just leave with a bang. Moo Won punches Ji Heon, reminding them of their battle at work. Ji Heon punches back, telling Moo Won to work hard. Moo Won tells Ji Heon not to regret it, because Moo Won won’t take him back. Ji Heon and Moo Won both lament how their parent refuses to accept their respective relationships. Na Yoon comes to find Eun Seol at DN Group, asking Eun Seol how she’s doing? Eun Seol is confused, since if Ji Heon leaves, Eun Seol will be pretty much re-fired again. As they are walking out, people point and snicker at Eun Seol. Na Yoon can’t stand it and starts bitching the women out, but Eun Seol restrains her. Na Yoon suggests they do a double-date this weekend to relieve some stress. The go tandem bike riding and take goofy pictures at the park. The night ends with the two couples having dinner and being all romantic. Or Na Yoon snuggles on Moo Won, while Ji Heon snuggles on Eun Seol. Cute. Moo Won and Na Yoon’s mom are dragged before the prosecutor’s office for tax evasion and having secret slush funds as well due to some suspicious painting transactions between them. Na Yoon’s mom cries while Moo Won’s mom yells that it’s all her fault. Director Park reads the paper and snerks that he’s the water ghost, didn’t he tell them? He goes to meet with the Chairman and apologizes for everything he did. He just wants the Chairman to forgive him. The Chairman says fine and tells him to shoo, but then laughs at how Seok Hee totally had it coming. Eun Seol comes to find the Chairman and wants his approval. He’ll give it if Eun Seol gets Ji Heon back to his position. Eun Seol says it was Ji Heon’s decision to quit. The Chairman tells Eun Seol that the person he dislikes the most is her dad, followed by her. 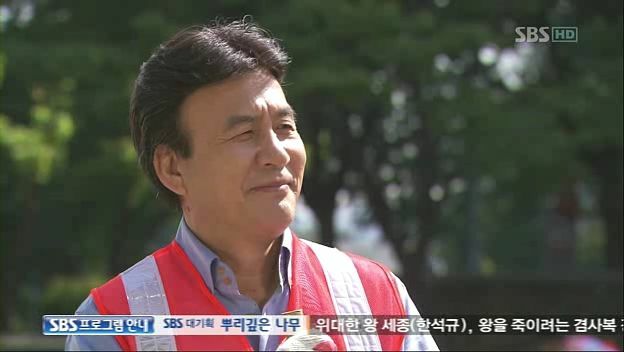 Eun Seol keeps sticking by the Chairman’s side during all his community service activities. He acts all annoyed, but secretly smiles because she’s so persistent. Na Yoon sticks by the side of the two moms during their community service, begging them to please consent to her and Moo Won. The two moms are annoyed and keep ignoring her. The Chairman, with Eun Seol begging him, run into the two moms, with Na Yoon begging them. He laughs at them, and offers to show them the best way to scrape gum off the ground. Moo Won’s mom asks why Eun Seol is stuck by his side, to which the Chairman says Eun Seol is like a piece of gum he can’t shake off. Na Yoon realizes that Eun Seol is doing the same thing as she is. Ji Heon is begging Eun Seol’s dad who refuses to give his consent. Eun Seol comes home and says she’ll handle it. She’ll duel with her dad and if she wins, he will have to agree. Eun Seol’s dad sighs. Moo Won meets with Grandma, who grumbles that her two grandsons are in the clutches of women these days. Na Yoon lounges around her apartment eating snacks. When she gets a call that Moo Won is coming home, she runs around cleaning up her messy place and runs out to buy groceries. Na Yoon starts attempting to cook, which is just a disaster. Moo Won arrives and sees the mess she made. She starts to explain that she could cook back in New York, but all he asks is to make sure she’s not hurt. Moo Won takes off his jacket and tells Na Yoon to leave it up to him. Moo Won God deftly slices vegetables and cooks a delicious pasta for dinner as Na Yoon peers over his shoulder. 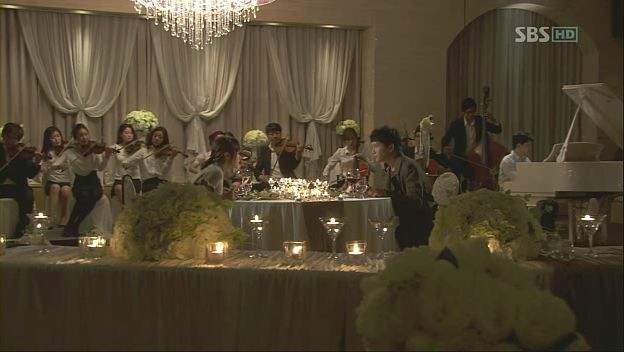 They sit down to eat and Na Yoon compliments him on having no limit to what he can do. They end the night having a glass of wine. Moo Won tells her to listen to him carefully now. He wants to try to be a clean businessman, not just someone who says all the right things. He’s knows it won’t be easy, he may fail and be discarded. Would that be fine with her? Na Yoon looks confused, and Moo Won laughs that she is so dense. He asks pointedly if she’ll walk the road with him. She asks why he can’t propose properly. He says he’s not proposing, but she hugs him. He sighs that he is proposing, but they can’t get married anytime soon. Because she’s still a child, one who he wants to nurture properly until she’s all grown up and he’ll marry her. Ji Heon sits with his dad and asks one final time for his dad to consent to his relationship with Eun Seol. He reminds his dad that in the end, his dad always loses. Ji Heon says that he will go to the sauna and give his dad massages, will go on vacation with him, take him on dates, cook food for him. He will do all this, to get his dad’s approval. Ji Heon asks his dad to be a man and open-minded, to consider it carefully one final time. 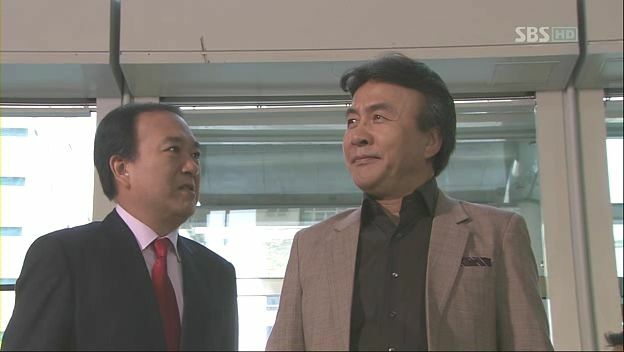 The Chairman sighs and Ji Heon walks outside. The Chairman sits for quite some time in deep thought. He finally walks outside to where Ji Heon is sitting in the yard. He asks Ji Heon what he would do if the Chairman continues to oppose. Will he run away? Ji Heon says yes, and he won’t let him see his grandson. The Chairman says he won’t allow that, he wants to raise his grandson to be his successor. Ji Heon stands up and asks his dad if this means he agrees? He hugs his dad and thanks him. The Chairman hugs Ji Heon back. The Chairman goes on a TV program and apologizes to the public about his mistakes. He uses this opportunity to explain that he won’t make his son his successor at the company. Grandma watches the news program and remarks that this is a fresh new start. Ji Heon heads out to pick up Eun Seol, together they go to a fancy restaurant. She reminds him that she hates wasting money. He promises this is the last time. She says she doesn’t hate using money, just wanting to spend the money better. She suddenly asks if Ji Heon is planning to propose? He drops his fork in shock and she apologizes for not pretending better. Ji Heon says that since Eun Seol figured out what he was planning, he might as well come straight out now. He asks Eun Seol to drink her coffee. She doesn’t want to because she’s full. When Ji Heon looks stricken, she gulps it down, and inside the cup is a note written in chocolate “I love you, Noh Eun Seol.” Ji Heon has even more little items that keep saying “I love you, Noh Eun Seol.” She’s so happy to receive these gestures. Suddenly the orchestra starts to play a slow song. 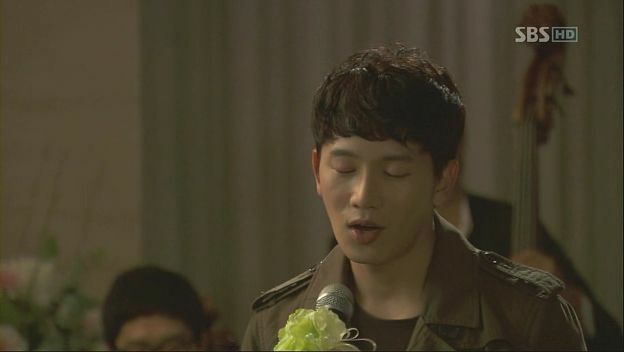 Ji Heon stands up and starts to sing to Eun Seol. Together the two of them flashback to all their moments together as boss-secretary, boyfriend-girlfriend. 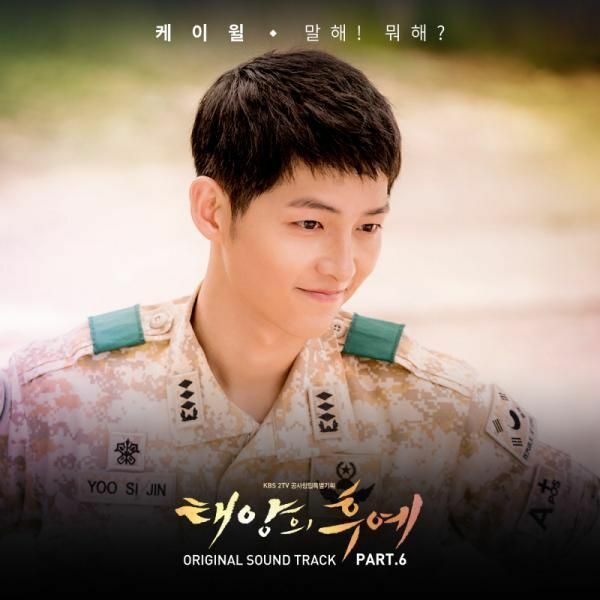 Ji Heon sings that he promises to love her more than anyone else for the rest of his life. He finishes singing and Eun Seol happily claps. Ji Heon walks over to Eun Seol, asking if they can fall in love even more after they get married? He takes out a ring and puts it on her finger. He asks her what her answer is? She stands up and gives him a kiss, asking if this answer is good enough? They hug each other, and Ji Heon says this answer is absolutely fine. Eun Seol is getting made up for her wedding. Myung Ran and Na Yoon run in to take her to the wedding. The ladies exit the car outside the wedding hall. Suddenly a thief grabs Na Yoon’s clutch. Eun Seol grabs a can and sends it via a flying kick into the head of the thief. They run to retrieve the clutch, opening it to discover the ring is missing. Eun Seol and Ji Heon walk down the aisle to the applause of all their guests. The Chairman grumbles about the wedding, with the two dads sending each other dirty looks across the aisle. Eun Seol looks at all her guests and wonders what tomorrow will be like? Secretary Jang calls the Chairman asking if he can stop going on matchmaking dates, getting rejected is making him depressed. Suddenly a woman walks in and the Secretary stands up with his mouth wide open. We see Director Park is at the wedding, and he’s changed jobs as a waffle maker, selling waffles to the coffee shop employee. Eun Seol says some people have new jobs, others get promoted. Myung Ran is driven to the airport by Secretary Kim. She cries that she doesn’t want Na Yoon or Eun Seol to drive her because otherwise she’ll cry and not get on the plane. Myung Ran vows that even if she can’t become a professional wrestler, she’ll at least sample the air of a more advanced wrestling nation before returning. The two moms continue to conspire, wondering if they should align to make Moo Won’s position stronger at the company. Grandma plays on her tablet computer at the coffee shop, enjoying learning new things and living her life. The Chairman looks at a collection of business cards as he returns to the company with trusty Secretary Jang by his side. Eun Seol wants to face tomorrow with Ji Heon, hoping tomorrow is a clean day with lots of promise. The bride and groom look at each other. Ji Heon wonders what tomorrow will bring? Eun Seol replies that she doesn’t know? Ji Heon is being interviewed about how, as a third generation chaebol, he started his own hedge fund and incubation company for new technology. He’s asked about a lecture he gave recently about how to become a successful person, one has to love the right person. Ji Heon laughs about how he has a lot to learn. Whatever he does, he thinks about whether it will make the person he loves happy. Eun Seol watches this interview on her tablet computer while standing in the rain at the park. Na Yoon and Moo Won are in her living room hanging out and watching the interview. She says they constantly make the news these days. Na Yoon wonders when they will get married. Moo Won pulls her up and says she’s definitely grown some these days. Na Yoon says she’s all grown now. Ji Heon and Eun Seol share an umbrella and walk in the park. They tease each other, ending the scene with a few quick kisses leading to a deep full kiss. Who knew a measly 2-episode extension can so mess with momentum? Now I will always lament what PTB could have been, as opposed to what it turned out to be. I have no regrets watching this drama, and really enjoyed recapping it during the early half of its run. It was refreshing and odd, not terribly meaningful or realistic, but grounded everything in an attempt at decency that I really appreciated it. But so much of my love was seeped away from the final few episodes that the ending became just a solid conclusion rather than a meaningful farewell. I loved how the drama gave a glimpse at where everyone ended up, because this was one of the few ensemble dramas where sometimes the secondary characters stole a scene or two here and there. I thought the Chairman’s refusal to accept Ji Heon and Eun Seol’s relationship still felt forced, ultimately never really ringing true for me. Same goes with the moms not approving of Na Yoon and Moo Won. Eun Seol and Ji Heon making up was as easy as it should have been all along, confirming for me how meaningless to was to keep them frustrated with each other for so many episodes, other than to generate plot. I’m glad the two couples go their happy endings, both personally and professionally. Whatever Eun Seol ended up doing with her life, her most important job was likely as Ji Heon’s partner in career and family. I found Ji Heon’s emotional and professional maturation quite simplistically presented, with plot wasted on the corporate shenanigans, so in the end we just are told to accept Ji Heon’s ultimate transformation into a self-made man. I don’t discount he could become successful in his own right, only that the drama didn’t really lay out the foundation very well on that front. In the end, PTB isn’t a drama I’ll find myself wanted to re-watch, it’s joy for me derived from a set up that was never executed properly and limped to a satisfactory if not wholly satisfying conclusion. I really loved all the main characters (and actors who played them) in PTB, who had such great chemistry with each other it helped gloss over a lot of bumps. I put PTB away with a sigh and a smile now that it’s done, akin to reading a book that was entertaining but splotchy. In a sea of crappy dramas, PTB was surprisingly good, but sadly never had a chance to be great. *crying and sobbing * Thank you, koala!! You know it’s you who got me into this drama at first and I am forever grateful. And I appreciate that you are always candid in your criticism and affirmation. I know it’s not easy to do a recap while adding your comment since you cannot do fan services to all the people ALL THE TIME (including me, lol). That’s that’s why I keep coming back to your blog because I want to hear different voice. Thank you again! I love PTB despite its flaws. And CKH becomes one of my favorite actresses-together with Gong Hyo Jin. And I am currently watching “Friends, Our Legend” and I really love WJH in this series. I loved watching this drama because the cast made a pleasure for me. One of my favorite actors Ji Sung made me not blink on couple of scenes and I even found a few I will now follow. All in all, I enjoyed myself. Thanks for all the recaps Koala. ~_~. Yes, it is sad how it became muddled with the extension. I can completely agree – but at least the ending was sweet and endearing. This was definitely one drama where I adored the secondary characters so much more than the main ones. I loved Ji Heon and Eun Seol as a couple but I wasn’t really invested in them – they were just amusing to watch. I totally loved Na Yoon though, and I’m so happy she finally got Moo Won. Thank you Ms. Koala for recapping PtB from ep 1 till the end. The final ep has some hilarious PtB moments: NY mom- MW mom – JH dad scraping gum together, all the can kicks… and lovely PtB moments: JH proposal, double date. Overall PtB is a refreshing drama and I will miss everyone here: JH-ES, NY-MW, Cha cousins, Cha daddy, Grandma, MR-Sec Kim. Million thanks Koala! I love your blog! PTB made me laugh from week to week.. i love all the episodes, even there is a little angst in it but it wasn’t reducing my love for this drama at all. LOVE..LOVE..LOVE.. Finally, really thanks to you, Koala..i enjoyed your recaps from the beginning until the end.. Hedge fund? How did that happen? Thank you for the PTB journey! I couldn’t stop smiling during this episode. Thank goodness it has gone back to its light mood for the finale. 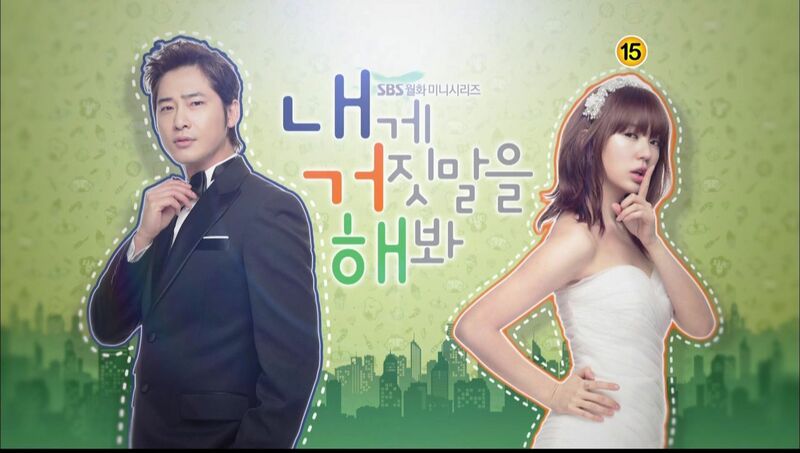 My only quibble was Eun Seol’s ill-fitting wedding dress. “I found Ji Heon’s emotional and professional maturation quite simplistically presented, with plot wasted on the corporate shenanigans, so in the end we just are told to accept Ji Heon’s ultimate transformation into a self-made man. I don’t discount he could become successful in his own right, only that the drama didn’t really lay out the foundation very well on that front.”—> Totally agree with your statement here. I think this is what prevents me from giving this drama an A or A+. Instead I give it somewhere between a B+/A-, though I lean towards an A- just because I love all 4 leads. Yes they had the extension – no fault of their own since time was needed for the next production to get ready- but I think they could have weathered the extension very well if they had kept better focus on Ji Heon’s development. The corporate storyline could have been used to help him develop into this self-made man and to show off the Ji Heon and Eun Seol partnership instead of using it to create angst. I will definitely be rewatching bits and pieces of this drama. The characters are so lovable, especially Na Yoon. Drama writers, you can write an adorable 2nd lead and the world won’t implode upon itself! Thanks for recapping! The last 4 episodes were kind of lame, but overall it was a nice drama to watch with uneven episodes. The scene with everyone scraping gums off the street was hilarious! Scenes like these make PTB so unique. They are not really funny but they manage to bring a stupid smile on my face. ^^ I am gonna miss CHairman Cha d most! He deserves an award for this role! I’m still squeeeing at how perfect Moo Won god is. Like waiting for and helping Na Yoon mature before taking the next step in their relationship. Is this the final episode of Protect the Boss or there is more episode? Wait! so the prediction is right? ?..Someone predicted on the comments at the beginning of the season how JiHeon will end up with Eunseol and Moowon will become the chairman. So, it was right, afterall. Thanks for the recaps Koala. This drama has been an awesome with you. Still love this drama! Not too much angst!! Koala, thanks for the recaps…Loved the ending episode. Tank you for the recap. I had lost interest in this show midway but I find this ending very satisfactory. Although I hate the way you color your recaps after you’ve been GROSSLY disappointed (which you usually are), I appreciate the time you take to spotlight the dramas here so I can read everyone else’s reactions. This was such a GREAT series and even with their hiccups, I felt it was one of the best K-dramas I’ve ever watched, especially the family relationships. I appreciated all the actors and the fine job they did and I will miss the Cha family greatly. No more dramas for awhile for me now and definitely no coming back here unless it’s a must see drama so I can see what everyone is talking about. But, you haven’t changed since Mary and the way you dragged that drama through the wringer. (Not saying it didn’t deserve some of the complaints but damn, you are BRUTAL and way too over analytical. They are called dramas for a reason–they are meant to entertain, that’s all) But your opinion is your opinion and this is your blog so I do respect it, even if I don’t agree. Thanks again for the great pictures! Lastly, i do appreciate for your consideration for pick up this drama and your time for recapping. Thanks, Koala!! Dear Koala, I want to say thanks for all your hard work. In part, I agree with you, in deed this drama has some holes here and there. But there’s something inexplicable about this drama that made me still fall in love with it like crazy!!! I feel for every character in this drama. They all are so vivid in my brain and will be there for a while, I know. It’s like the drama has cast a spell on me. Hi, can someone tell me the name of the song JH sang for ES before he proposes her? Thank you so much! I completely agree. This was the first drama that I followed while it was on air and it’s made me wish I didn’t because as much as I like the characters and the moments, it felt like it dragged for me towards the middle/end. The business/whistle blower plot was not interesting enough for me. I also felt that it was so contrived how much JH’s father opposed their relationship when he loved her so much at the beginning and knew she wasn’t the one to blame. I loved the ending though and felt that it was a beautiful conclusion to the series for all involved, but the last couple of episodes to get there were a bit hard going on. I do think there are some wonderful moments in this drama, but it’s not as rewatchable for me as say LTM (which I agree with you that it makes me happy even though I personally felt it dragged in the last ep too). Thanks! I didn’t want Moo Won to be the successor. He didnt play fair when he used Ji Heon’s condition against him. The two evil mothers got their way when he became chairman. 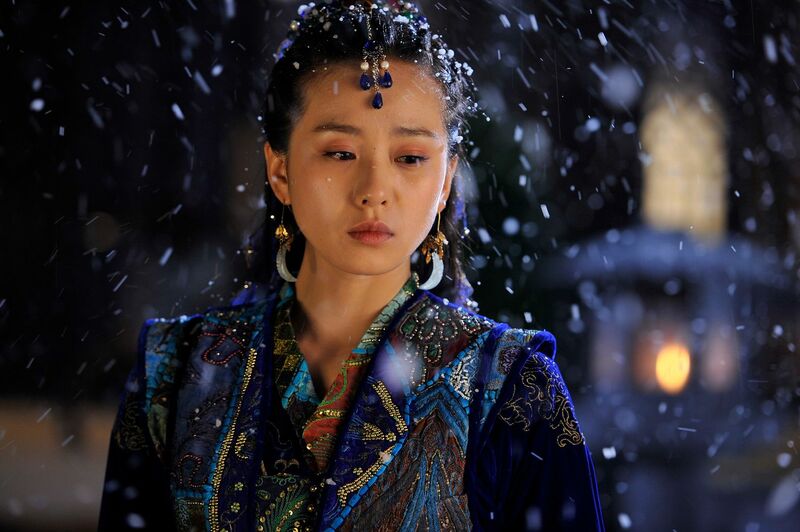 And Na Yoon was a spoiled princess who got her way and her man in the end. I loved Ji Heob. He was innocent and fair. He also was not like the other guys in dramas of being mean to the girl initially. He knew in the first few episodes that he liked Eun Seoul. He was nice to his cousin as well. He also overcame his anxiety which is hard to do. Wished he became the chairman.